Please select the appropriate link below for the type of sign you wish to order. 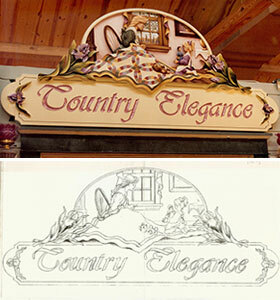 House Signs and Business signs require a 50% deposit on the quoted price before work can begin, with the balance due on completion of the sign (prior to shipping). Payment in full is required for Custom Canvas Floor Cloths before work can begin. These pieces require a custom quote based on the complexity of the seal or coat of arms. Please email us a picture of the desired seal or coat of arms and we will be happy to quote you a price.